Published in Altered Hearts Zine! Tooting My Own Horn! 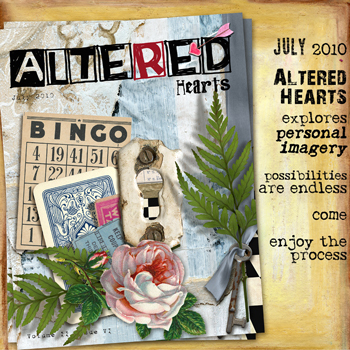 I am so thrilled and excited to be featured in the July 2010 issue of Altered Heart digital zine!! There are two pages full of images of my collage art and soldered jewelry as well as some questions and answers about my background, working process, etc. I want to thank Edeena Cross for contacting me and putting together such a wonderful article! Click here to purchase and download the July issue, it’s only $3 and it’s chocked full of wonderful ideas, articles, interviews and even free downloads too. If you’re into collage, digital, or altered art I highly recommend this great online magazine!